Working in the chemical or metal processing industry requires a high level of dexterity and flexibility. 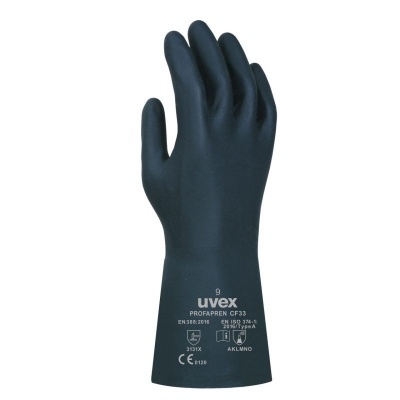 The Uvex Profapren Flexible Chemical-Resistant Gauntlets CF33 are constructed from chloroprene, which allows you to retain your dexterity throughout use, while the flocked cotton liner allows you to remain comfortable and perform tasks at ease even for prolonged periods. The Profapren Flexible Chemical-Resistant Gauntlets CF33 are available in four sizes that should suit the hands of most users. Please measure the circumference of your hand around the knuckles (excluding the thumb) with your hand open and your fingers together, and the length of your hand from the tip of your middle finger to your wrist.